I designed this as a small outdoor knife. 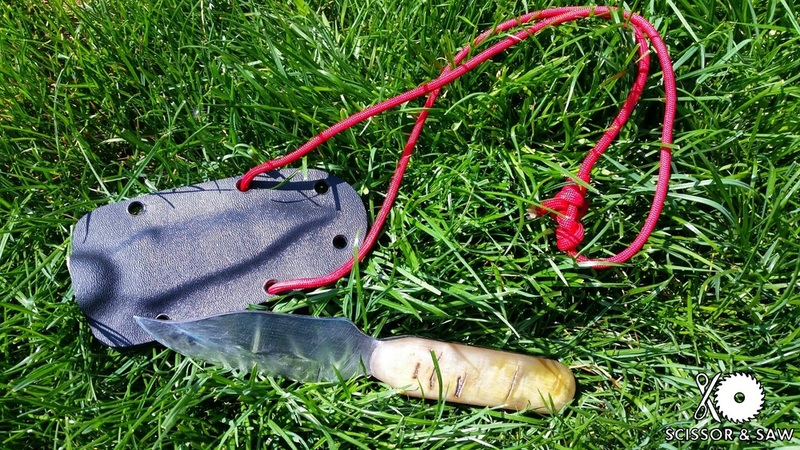 It's made out of 1084 steel and sheep horn handles with a clip point shape for a classic woodsman look. The kydex sheath is for a simple neck knife, though it's a bit heavy for that role. The raw material is a 3/16" thick bar of 1084 from NJ Steel Baron. I didn't spend a ton of time drafting a design and mostly just sketched it on. Were I to do it again, I would have brought the edge much father back because with this thick of stock it makes for a very tough but not particularly sharp knife. Also, the central "pinch" is a little too small and I would have eliminated the top curve for the thumb ramp. Instead of using the angle grinder I used a small metal drill bit and went around the border of it. From there I used a hack saw to pop between the holes and vice grips to remove sections. It has the benefit of being a cooler process that doesn't burn the steel, but is also much slower. The more intricate sections are easier to get to this way, however. After the large sections were cut out, I removed the burs with an 80 grit belt sander and hand files. These three pictures are through the heat treat process. The top is almost ready to be hardened (just annealed). The second is immediately after hardening and the final is after tempering. The hardening was done in conjunction with an aluminum ingot smelting process using a cast concrete furnace. The propane burner is from Backyard Metal Casting using a smoker regulator. The picture above is from pouring the liquid aluminum but the paint bucket to the right contains the canola oil used for quench. The toaster oven has been modified at the hackerspace to use a PID Digital Temperature Controller and a salvaged high-amperage relay. Another member helped me to wire it, but it's not overly complicated The probe (the wire hanging in the door) measures the temperature and the controller turns on and off power to maintain the internal temperature within one degree Celsius. It's actually a pretty remarkable little computer because it seems to control for temperature ramping. This is the same oven that I use to soften Kydex with the sheath. Some day I'll get around to building a case for the electronics. You can find the temperature and times for tempering 1084 at Cashen Blades. Once heat treated I cut the sheep horn scales. I bought them on eBay and had to sand the back a little to fix a slight bend. Since horn is actually made up of dense hair, cutting and sanding it smells awful. It's very soft and as an organic material is more sensitive to things like UV and heat. Once I cut it out on the bandsaw and roughed up the back I affixed it to the blade with T-88 two part, 24 hour epoxy. I've used it on a few projects and it's great (albeit messy) stuff. Wear nitrile gloves when working with it for easy cleanup. After it was set, I cleaned the scales up and rounded the edges using files and elbow grease. At the recommendation of Hephaestus Rising I used some carnauba wax on the horn which really made it shine. On the metal I used home-made Renaissance wax that was given to me. The knife did not turn out as precise as I would have hoped but the softer curves fit nicely in my hand.